The first two Firefox OS phones are already on sale – they are the Keon and Peak from GeeksPhone. The two are aimed at developers and run a Developer Preview of Firefox OS, so while they might not build up a user base they should help devs have apps ready by the time the consumer-oriented Firefox phones hit the stores. 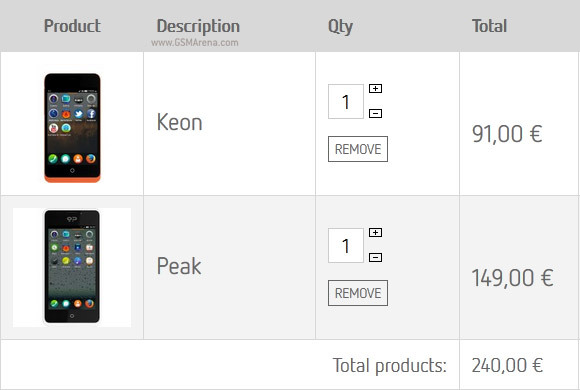 The prices are as announced a few days ago – the Keon costs €91 and the Peak is €149. Keep in mind that those prices do not include taxes. The phones will be shipped worldwide. The higher end phone, the Peak, packs a 4.3” qHD screen, 1.2GHz dual-core CPU with 512MB RAM, 8MP camera and 1,800mAh battery. The Keon has a 3.5” HVGA screen, 1GHz single-core processor, 512MB RAM, 3MP camera and 1,580mAh battery. There have been reports that the GeeksPhone site is experiencing issues and your order might not get though. As a side note, you can also use a Sony Xperia E for development purposes, Sony released a ROM that puts Firefox OS on the entry-level Android phone (its specs are similar to that of the Keon). Thanks to James for the tip!